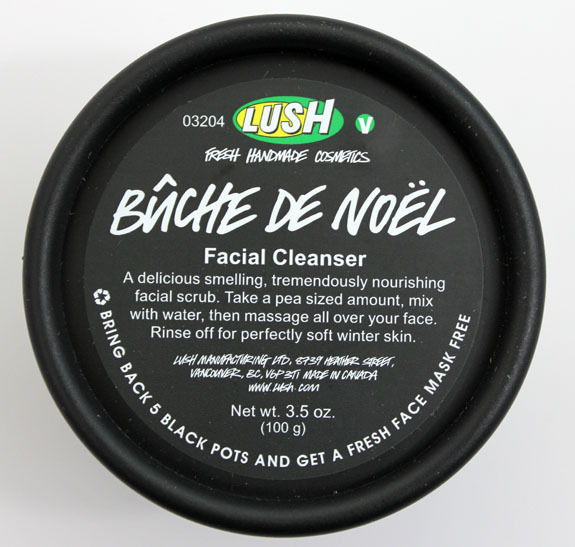 Home LUSH	Lush Buche De Noel for Holiday 2011 Review & Photos! 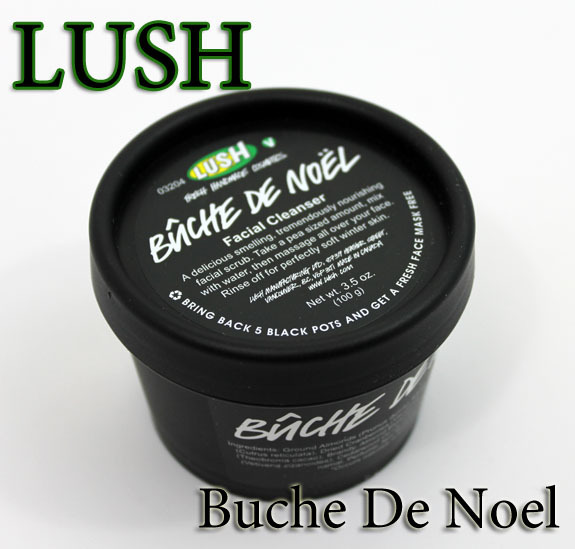 Lush Buche De Noel for Holiday 2011 Review & Photos! Lush has some really nice offerings this holiday season and one of them is called Bûche De Noël. That’s French for yule log (the kind you eat)! This isn’t so much of a yule log as it is a really interesting facial cleanser. It’s a slightly scrubby cleanser that contains ground almonds, almond oil, kaolin and cocoa butter, and is surrounded by seaweed for nutrients! This baby also packs a fruity punch with cranberries and satsumas mixed in. 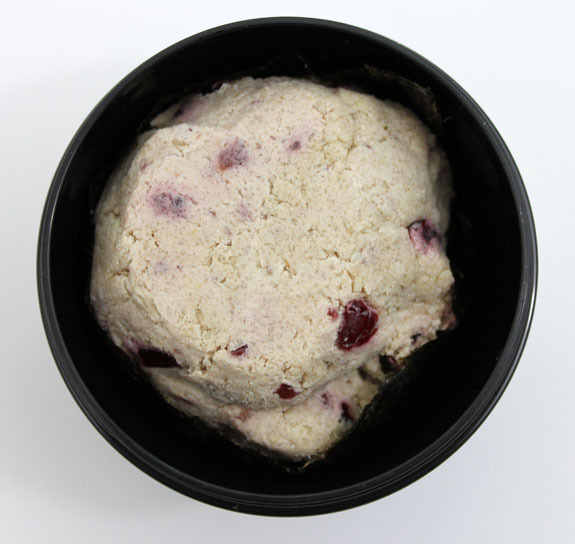 Doesn’t it kind of look like cranberry cookie dough? It also kind of feels like cookie dough! It smells divine. Slightly spicy and very almond-y. You know me, I am an almond scented sucker, it may be my favorite scent ever, so this was very pleasing to my nostrils. The way you use this is, you break off a pea-sized chunk and kind of mash it around with your fingers and a tiny bit of water which creates a paste. Then you scrub it all over your face and rinse. I did find that using my fingertips for this made some of it fall into the sink before it was mashed up. It may work better to use the palms of your hands for that part. It doesn’t feel overly scrubby or harsh at all and makes your face feel very fresh once it’s rinsed off. The one negative I experienced was my face did feel a little tight and dry afterwards. Not overly so, but noticeable to me. Pricing: $12.95 for 3.5 oz. What do you think about using a product like this? Have you ventured into Lush land yet? Is this ok to use on sensitive skin? If your skin is SUPER sensitive I would say maybe not, but mildly so, probably. The scrubby-ness isn’t very harsh at all, so it didn’t feel like it made my skin raw or anything like some scrubs can. Hmm I might have to give it a try. I really like Lush stuff because of the vegan part – as my skin reacts bad to most of the widely sold skin products out there (chemicals). If you’re worried about the products, you can always pop into your local store and ask for a sample to try at home. They’ll happily give this to you, and it’s generally a very generous amount too, good for 2 or 3 uses! That way you can check it out on your skin before committing to a whole tub. I used to like Lush products, but my skin has become more sensitive with time. I can’t use anything with scrubbing grains and have to exfoliate with gel formulas. It is too bad because this looks pretty and the smell sounds divine. Melli´s last post…I Take Requests! This is my favorite face scrub that they make, I wish i could get it year round. My dry skin LOVES it! WOW! That looks awesome! it does look good enough to eat 😉 I haven’t tried them–yet–but I’m sure I will in the near future! I have never heard of anything you use like that, but I am very intrigued. I too am a sucker for anything almond scented! Looks delicious. I’ve never used any Lush products. Don’t think I want to get started. I know I’d become obsessed. Looks cool! Haven’t tried them yet, but have only heard good things. Have to try this out! Love almond scented things, too! Thanks for showing! Have a good day! 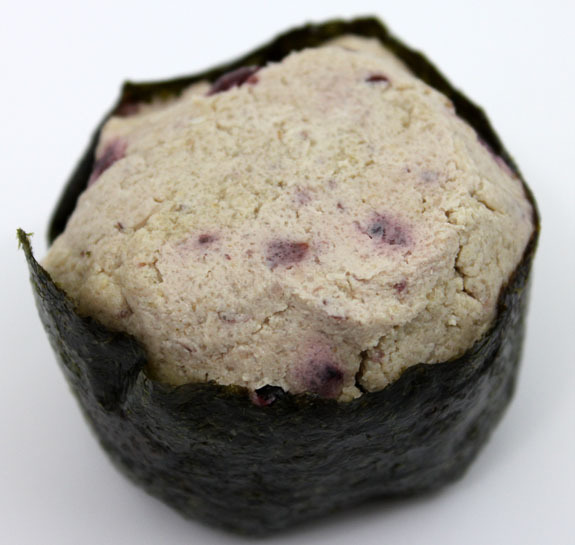 I guess I’m in the minority in saying that it looks disgusting… Like some science experiment I might find in my fridge – esp with that last pic. I don’t want to put that on my face, Lush! This reminds me a lot of Angels on Bare Skin and actually I got an angels with this ingredient list printed on it so I’ve been waiting for this to come out for a few months now. I think I’m really going to have to pick some up and try it out! Looks good enough to eat! Lush is killing me with all their Christmas products! I’m trying hard to resist but they all look great. Katie´s last post…11 Halloween Nail Art Ideas! maoam! I’ve wanted this since I saw it in the magazine they have, now when viewing it full sized and how it actually look, I want it moooore!